Finishing June with over $3 million in debt and three consecutive months of record low donations, the Democrat Party is going broke! As I have been saying for over a year, the Democrat Party is dead. They just don’t know it yet. After three consecutive months of record low donations, the DNC finished June with over $3 million in debt. What would they expect. Their only message for the past two years has been “Vote for us because Trump.” No platform, nothing positive, just the same old agenda of giving America away to strangers. 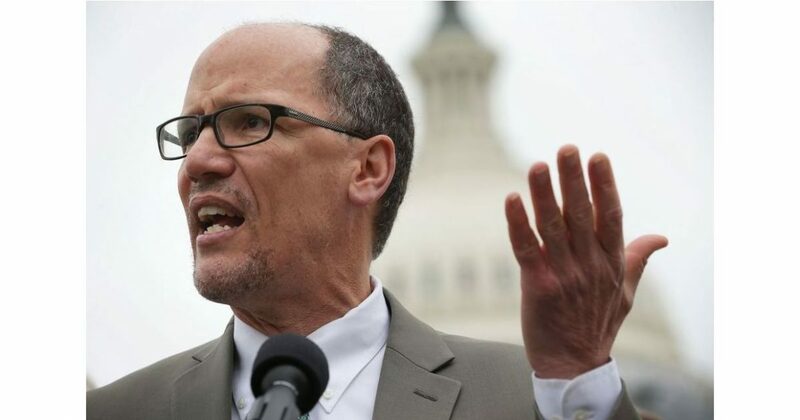 DNC Chair Tom Perez recently sent out a fundraising email to supporters claiming, “I know garbage when I see it,” citing that he once worked on a dump truck, reports the Observer. It’s ironic that he referred to the GOP health care bill as a “flaming dumpster fire” because he has been presiding over the disaster that is the Democratic National Committee. The organization reported that May 2017 was its worst fundraising month since the Iraq War in 2003, and April 2017 was its worst fundraising month since 2009. In May, the DNC also reported that it has $1.9 million in debt. Despite the fact that former Secretary of Labor Tom Perez was recruited by Barack Obama to appease the party’s donors, lobbyists and PACs, even they have refused to prop up the failing brand. Democratic voters have so far refused to fill the fundraising void left by the party’s corporate and wealthy donors. Tom Perez is a painful reminder that the Democratic establishment has suppressed reforms that would prove to voters that the party is prioritizing their interests. Democratic leadership subverted pro-Sanders DNC chair candidate Congressman Keith Ellison’s candidacy, ignored demands to ban superdelegates, and failed to re-enact the ban on lobbyist and PAC donations that Debbie Wasserman Schultz lifted to enable Hillary Clinton to keep up with Sen. Bernie Sanders’ fundraising. Perez’s Unity Tour with Bernie Sanders backfired; he was met with boos at several of the tour’s stops and supporters showed up in favor of Sanders—not the DNC. Senate Minority Leader Charles Schumer and House Minority Leader Nancy Pelosi are prepping to unveil “a better deal” economic agenda to show voters that Democrats have a more robust plan than Republicans. However, Politico reported that several Democratic congressmen are opting to focus on their own message because they no longer trust leadership’s ability to connect with voters. These congressmen were proven right last week when the Democratic Congressional Campaign Committee unveiled four new slogans, all of which were tone deaf and failed to inspire support among voters. Instead, they were more of the same anti-Trump rhetoric but with a hint of condescension. The DNC has failed to salvage its reputation after former Chair Debbie Wasserman Schultz resigned in disgrace for rigging the Democratic presidential primaries. The DNC needs a drastic overhaul to recoup its losses. The party needs to stop relying on Trump’s ineptitude and develop clear messaging of its own. Unfortunately, the current Democratic leadership isn’t capable of mitigating failure in this respect. In stark contrast to the nosediving finances of the Democrat Party, Republican coffers runneth over. As reported by The Hill, the Republican National Committee (RNC) raised a record $13.4 million in June, bringing its total 2017 fundraising to $75.3 million. The Democratic National Committee (DNC) has yet to release its June fundraising numbers. The DNC was vastly outpaced by its GOP counterpart in May, raising only $4.3 million compared to the RNC’s $10.8 million haul.